Welcome to Batting Around, a biweekly curation and analysis of Minor League Baseball off-the-field news from around the country, locally sourced whenever possible. If you have an item to contribute for potential inclusion in a future edition, please email Ben Hill. 2015 will mark the Brevard County Manatees' 22nd season at Space Coast Stadium. Might it be their last? Reports surfaced earlier this month that the Manatees -- the Class A Advanced affiliate of the Milwaukee Brewers -- may relocate to Winter Park, Florida, in time for the 2016 campaign. Winter Park, a suburb of Orlando, is located approximately an hour to the northwest of the Manatees' current home of Viera, Florida. Mike Miller of Rollins College is spearheading the effort. He says Alfond Stadium, where Rollins currently plays, will be rebuilt into a 2,500 seat Minor League stadium, which the college and team will share. "Enhancing our baseball stadium with the help of the community is only going to better our program and ... having a professional baseball team will be a very exciting addition to our whole community." As is almost always the case with such situations, there are a multitude of moving parts. As Fox 35 reports, the current plan (and best-case scenario) is to "have a full vote of the City Commission in August, then go through a planning and zoning phase with public input in the fall. Construction would begin in 2015 with the [Manatees] moving over for the 2016 season." Winter Park is part of the Orlando market, considered to be the largest market in the country without a professional baseball team (the last affiliated Minor League club to play in the city was the 2003 Orlando Rays, who relocated to Montgomery, Alabama, the following season). 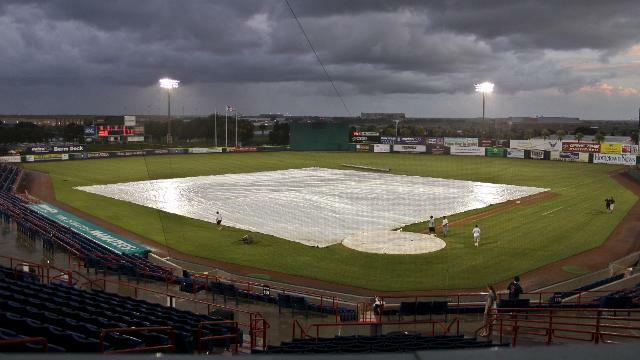 The Manatees, meanwhile, averaged 1,451 fans a game at Space Coast Stadium in 2013 (placing them eighth in the 12-team Florida State League). Space Coast Stadium also serves as the Spring Training home of the Washington Nationals. New owners, same miracle: On April 28, SJS Beacon announced its purchase of the Florida State League's Fort Myers Miracle. For the last quarter century, the team had been owned by the Goldklang Group, which also owns the Hudson Valley Renegades and Charleston RiverDogs (as well as the independent St. Paul Saints and collegiate wood bat Pittsfield Suns). The Miracle have long been one of the most promotionally innovative clubs in the FSL, staging everything from "Mike Tyson Ear Night" to a Craig Sager bobblehead giveaway. SJS Beacon is headed by Jason Hochberg, a self-described "lifelong baseball fan." In a press release put out by the team, Hochberg remarked that he hopes "to build upon the Goldklang Group's outstanding legacy and further enhance the Miracle's partnership with the Twins." "The decision to sell the Miracle, which was our first team in Minor League Baseball, was among the most difficult of my years in the game," added Goldklang Group chairman Marv Goldklang. "It was important that the reins be handed to an individual who shares our passion both for what goes on between the lines as well as the customer-service principles by which we have lived for the past 25 years." Mandalay on the block: For more than a year, the five teams owned by Mandalay Baseball -- Frisco RoughRiders, Dayton Dragons, Oklahoma City RedHawks, Erie SeaWolves and Scranton/Wilkes-Barre RailRiders -- have been on the market. The March 20 edition of this column mentioned that Chuck Greenberg (owner of the Myrtle Beach Pelicans and State College Spikes) had reached a preliminary agreement to purchase the Frisco RoughRiders, and now there's more where that came from. Josh Leventhal of Baseball America recently reported that preliminary agreements had also been reached to purchase Oklahoma City and Dayton, with the latter possibly fetching a "record price" upwards of $40 million. Indeed, the Dragons are one of the most successful teams in Minor League Baseball. The Midwest League club, the Class A affiliate of the Cincinnati Reds, recently sold out their 1,000th straight game. The baseball investors are under contract to purchase a 38-acre site in Fredericksburg's Celebrate Virginia South development. The U.S. National Slavery Museum currently owns the land. Though the site is well-located right along Interstate 95, development costs would be significant due in part to the land's hilly topography. The Silver Cos., which is developing Celebrate Virginia, is working with the Suns and Diamond Nation to reduce the construction budget to a suitable level. ... The Suns had originally been shooting to move to the complex in time for the 2015 season, but that timeline is in jeopardy due to the recent delays. It's still possible part of the complex could be ready in 2015. Richmond inches closer: One of the longest-running sagas in Minor League Baseball involves the battle to build the Richmond Flying Squirrels a new downtown ballpark (the team moved to Richmond in 2010 and plays in a 30-year-old facility known as The Diamond). Progress is being made, however incrementally. On May 12 the Richmond Times-Dispatch reported that mayor Dwight Jones made a deal with the City Council to restore $10.6 million in funding to his Shockoe Bottom development plan. Shockoe Bottom is the neighborhood in which the Richmond ballpark would be built; the money will be put toward land acquisition and infrastructure development.